The American Express Airpoints Card offers new Card Members 0% interest rate for the first 6 months and lets you earn 1 Air New Zealand Airpoints Dollars for every $100 spent. The American Express Airpoints Card comes with $0 annual fee, 50 bonus Airpoints Dollars and 0% interest on purchases for the first 6 months of holding the card. This card is one of only 5 to receive the Canstar 5 star rating for general reward value in the latest rankings of all reward earning credit cards in New Zealand – the American Express Airpoints Card has the potential to net you the highest Airpoints Dollars earn rate of any card on the market, and has no annual fee, not just for the first year, but ongoing. Let’s face it most of us like to know we are getting a good deal, like finding that elusive bargain award ticket or getting upgraded at your favourite hotel, and a card with no annual fee suits deal hunters. When it comes to credit card reward programs there are some good options out there that offer you large chunks of points quickly, but the problem is some can also come with large annual fees. If you’re a big spender or a large family you may be able to get the most value from those cards, but if you’re just starting out or wanting to dip your toes into earning points for the first time, getting stuck with a big fee for the privilege could be painful. 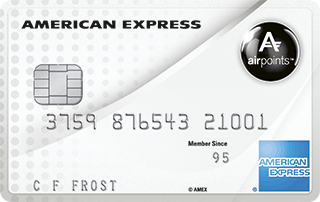 The earn rate for the American Express Airpoints Card is 1 Airpoints Dollar per $100 spent. Otherwise, there are few additional benefits to the card – which is not surprising given it comes with no annual fee. There’s no limit to how many Airpoints Dollars you can earn and each Airpoints Dollar is worth $NZ1 so the maths for redemptions is quite simple. You can use your Airpoints Dollars for more than just flights but also to pay for just about anything on the Air NZ website, from Travel Insurance and Koru Club membership to Hotels or even cruises. You can even gift them to someone else if you’re looking for an original birthday present. If you get email notifications from Air NZ grabaseat you’ll be aware that they can come out with some remarkable limited domestic and international flight specials. One such recent grabaseat sale had Auckland to Wellington seat only prices for $14 each way, $24 dollars including checked baggage. So what’s a 50 Airpoints Dollar bonus worth? OK, it’s $50, of course – but if using grabaseat it could be worth a long weekend return flight to Wellington. With no annual fee this could be a great card for those wanting to earn Air New Zealand Airpoints Dollars without being hit with a large fee each year. If you’re looking to up your Airpoints Dollars earn rate you’ll be better off looking at a higher annual fee card however. Based in Auckland, adventure loving Kiwi Clayton’s most challenging trip was in 2006 taking his kids (aged 4, 6 & 14) backpacking across Cambodia and Thailand. While juggling a full-time degree, part-time lecturing and house renovation, Clayton enjoys finding time to relax with friends and family. You can follow him on Instagram @Clayton_phnz. Point Hacks is published by Point Hacks Australia PTY LTD. In some instances, Newformula Media receives a commission or benefit for referring you to the services of a bank / credit provider. This commission or benefit is disclosed at the point of referral to the credit provider. This website does not provide credit or advise you to apply for credit assistance from any particular provider. We have not taken into consideration your circumstances or financial situation when providing the information on this website. It is important you read the relevant PDS from the product issuer and seek the independent advice of an appropriately qualified professional before making a decision on a product.